What a thought provoking, complex, uniquely plotted historical fiction mystery!!! The cast consists of cleverly crafted, well defined and interesting characters. 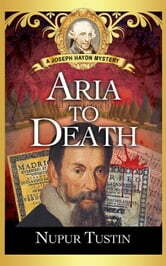 Murder, robbery, music, danger, intrigue, politics and suspense add to the fast paced adventures. This takes the reader onto the musical stage of Joseph Hayden who was an Austrian composer in the Classical period. Haydn's job title was Kapellmeister (music director) for the Esterházy family. Joseph receives a request from a friend to authentic a bequest of music scores. Before Joseph can authenticate them the man is found beaten to death. Joseph sets about to investigate what happened to this music and who has beaten his friend to death. He will be involved in a course that has many twists and turns making the puzzle harder to piece together. There is also a theft of Her Majesty’s valuable necklace. Her personal lady’s maid is accused of the deed. Other members of the household staff decide to investigate as they know Her Majesty’s maid is innocent. Danger lurks at their every turn... What a surprise to discover that incident ties into Joseph’s murder inquiries!!! The plot thickens. The various settings in the book are deftly described. The reader is made part of the story. You travel along with Joseph and the array of characters as part of their adventures. This is an engrossing historical mystery from the first word to the final word. A Highly Recommended Read!! I volunteered to read Aria to Death. Thanks to the author and publishing company via Facebook’s Cozy Mystery Review Crew for the opportunity. My opinion is my own. This was a very hard book for me to read. The story line and the characters are all over the place. I kept reading hoping it would sense but it did not. While I enjoy music and historical mysteries this one did not hold my interest. The book could be improved with a lot of editing as the initial mystery sounds interesting it just gets lost. There were also some grammatical errors.